I have a personal commitment to post at least one blog per week and it’s been more than a week since I wrote my last blog. The central theme of all my blogs is application of proven and time-tested mental models in day-to-day situations. Lot happened in the past couple of weeks and the reason for delay in posting this blog is to do with the application of below explained mental models. Given my situation, these models required me to delay all activities not considered priority in the context of what I was dealing with, the details of which you will read below. Prioritization is a very simple concept but very difficult to practice. I am privileged to work with some of the smartest, brightest and inspiring leaders who have achieved great success in life. I also closely follow the journey of few luminaries of our times such as Warren Buffet, Charlie Munger, Bill Gates, Elon Musk, etc. One common trait that I have seen in all these successful people is that somehow they know how to stay focused on things that matter the most i.e. know what is important and stay focused on it and know what is unimportant and stay away from it. Given the most valuable resource is focus / attention which in turn is partly a factor of time, managing time to keep the focus on important matters is what appears to distinguish successful people from the failures. The corollary is absolutely true of failures. They somehow always default to prioritizing unimportant things over important matters. ” … this common denominator of success is so big, so powerful, and so vitally important to your future and mine that I’m not going to make a speech about it. I’m just going to “lay it on the line” in words of one syllable, so simple that everyone can understand them. The common denominator of success – the secret of success of every man who has ever been successful – lies in the fact that he formed the habit of doing things that failures don’t like to do. This is all fine knowledge but nothing what is said above is actionable. The quotes above do not help provide a practical lens to differentiate important from the unimportant and how to deal with it. Also Just couple of months back, I was reading The Decision Book: 50 Models for Strategic Thinking and there I found this very useful and practical time management or activity prioritization model. The Eisenhower Matrix / method is a very simple, yet powerful method. The system uses a matrix of four quadrants to categorize tasks. You have to ask two questions: 1) Is the task important? and 2) Is the task urgent? As shown in the illustration below, every task ends up in one of the four quadrants. Priority 1 – tasks that are both urgent and important – Do it immediately. Priority 2 – tasks that are important but not urgent – Set a due date for completion. Priority 3 – tasks that are urgent but not important – Delegate to competent person(s). 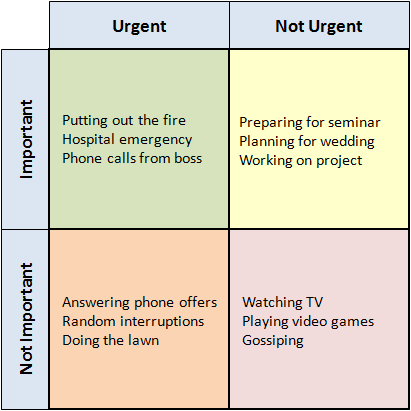 Priority 4 – that are neither urgent nor important – Avoid at all costs when you have other things to do. I mentioned above that a lot happened in the last couple of weeks. I changed jobs within the company and that involved – delivering against my existing commitments, transitioning my old job to my successor, ramping-up on my new job, meeting the new customers, stakeholders and team members etc. On top of this, my 17 months old son brought home viral infection from his daycare and happily gifted it to both my wife and I which we painfully endured for more than a week. With all these going on, prioritization of tasks and activities became very important and two models above helped me to move blog writing task to quadrant # 2 above.